“Come on. The sun will go down in an hour.” He grinned and then marched forward. “I knew this was a bad idea,” she muttered and hurried to follow. The flickering stopped and landscape became heavily forested when it had been rocky before. Written for the Rochelle Wisoff-Fields Friday writing challenge. The idea is to use the image above as the prompt for creating a piece of flash fiction no more than 100 words long. My word count is 98. I’m sure this sign is perfectly legit where ever it was taken, but it sure looks odd, especially the “leg” from my point of view in the U.S. Also, the “face” on the sign looks kind of alien. I let that rule my imagination when I crafted my wee tale. I wonder what Marcia and Randy have to offer them. The word limit wouldn’t permit me to add an explanation, but only the very brave and the very foolish would ignore a warning sign. Oh, come on James. The first thing half the world does when confronted by a ‘No Entry’ sign is walk straight past it. And we women aren’t much better! Of course, they are in the middle of nowhere, Penny. creepy and also reminds me of how sometimes someone needs to speak up…. Nice story, James. The man up ahead calling to them doesn’t sound hostile. Perhaps they’re in for a real adventure! You’ve left it wide open. It could be anything from a pleasant diversion to a wretched nightmare, perchance paranormal>? 100 words doesn’t allow for a lot of explanation, so I decided it was best to preserve the mystery, Larry. Yes, I love portals. They always lead to such interesting places. The man greeting them sounds gentle and charming. Watch out, Randy and Marcia. He may be selling time shares. “Just sign here”. Haha! Love your comment there, James! Uh-oh. They’re in for it now. They sure are, Alice. Thanks. Kloogie indeed! Pay attention to Marcia! LOL. He probably wishes he did, Alicia. Thanks. Hopefully those were fun-loving aliens who were waiting with milk and cookies. Yes, Varad. We can only hope. Thanks. I’m afraid this isn’t going to be a friendly visit. “You shall not pass!” I now wish I had used THAT line…here was my chance! I did…I added a link in my FF story. This could go either way… but the sign would at least take away the smart and cautious… brave and stupid is what’s needed whatever that can mean. We may never know. Since this is your photo, where is it, what is it warning against, and why are the legs so goofy? 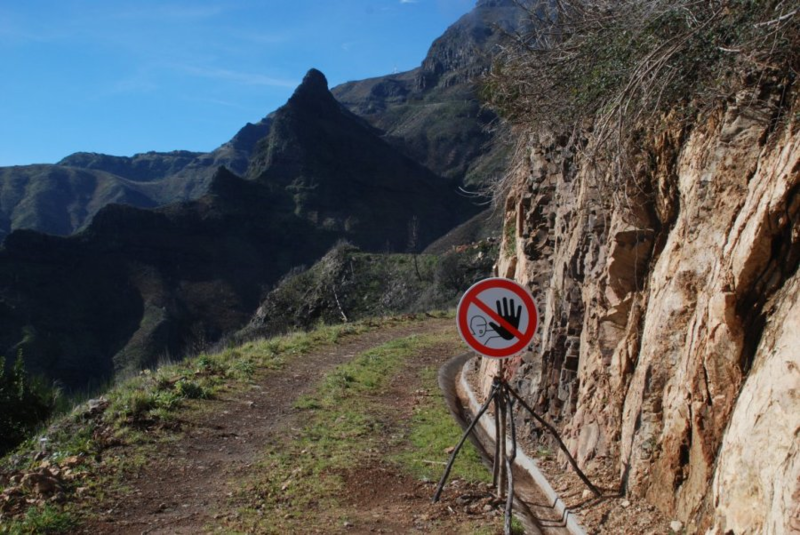 Ha.. this is a road on the Island of Madeira and there had been landslides so the road was gone pretty much beyond the bend… why the legs were so goofy I don’t know, but most likely they had taken what they could to set it up. i wonder if they’d be able to leave after enjoying their hospitality. maybe not, i’m afraid. No, probably not. Then again, it might be a more rewarding life than the one they left behind. Randy should know that signs are there for a reason. An evil generation doesn’t always look at the signs 😉 Life’s lessons learned too late. A lot of people don’t think the rules apply to them, Rochelle. This time, it cost them. I love an open ending and this is a beauty! I wonder…. Yes, their ultimate fate remains a mystery. Well, they were warned! I’m dying to know what “kloogie” means. It’s a term used by IT professionals meaning something haphazardly put together. Great bit of mystery – what happens next? That we might never know James, since they have passed out of our world. Flickering landscapes never bode well. Depends on your sense of adventure, Liz. I don’t think so. Too busy with other projects for one thing, Dale. Thanks, though. Oh my, it looks like they’ve come upon something a new dimension or something sinister. Nicely written, James. You’ve left me wondering about that voice. Indeed, Isadora. A mystery lies therein, however, I’ve got too many other authoring fish to fry to pursue it at the moment. Thanks. I usually listen to (my aka Marcia), and I’m still here to tell the story. Well done James. This is great. The ending leaves you wondering about what will happen next which is a great ending. That was deffo the intent. Thanks. It’s certainly meant to be, Sascha. Thanks. I love how it’s open to interpretation and how the picture could elicit numerous responses. Wonderful! It’s one of the things I like about these flash fiction challenges. The imagination can go anywhere and it doesn’t take long to arrive. Thanks.